Ever since moving to a larger home two years ago, I’ve been dealing with WiFi dead zones. The home is 2800 sf and it is a two-story home. The footprint is not very large though. You would have thought that a centrally located router/access point (router) would do the job. Not so. From day one I’ve had problems. The cable company router is located upstairs and in an office, while not central, very close to. The first solution was to purchase one of those high-powered octopus antenna router units. This helped the adjacent rooms, but didn’t reach downstairs to the FireTV Stick in the back of the family room TV. Second solution was to use a RAIR (redundant array of inexpensive routers) wired together with Ethernet over power lines with TP-LINK units. The remote routers were put in access point mode by turning off DHCP and assigning a static IP address to each unit. This was successful from a technical standpoint. There were four routers all connected to the cable modem router and it worked…sometimes. The TP-LINK units had to be power cycled about once a week. The final solution turned out to be one of the latest mesh WiFi network setups. I purchased Google WiFi on the recommendation of tech guru Ty Smith. 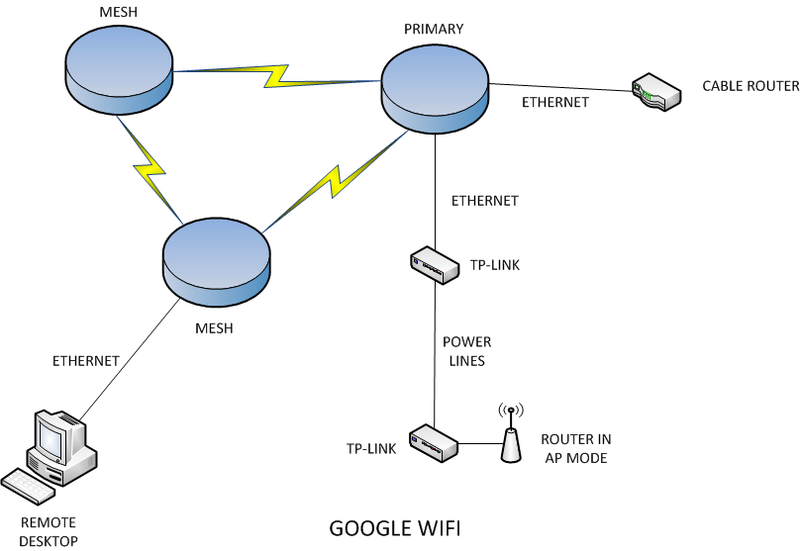 I unplugged all the RAIRs and configured Google WiFi following the instructions. It just worked. The mesh WiFi units were put in basically the same locations as the remote routers, but now everything works. No static IPs and no TP-LINKs. Well, that’s almost true. My twins’ bedroom still has cruddy WiFi. So bad that they could not do homework on their Google Classroom account and turn in homework. The configuration below is what fixed it all. Good thing I didn’t throw away the TP-LINK units. Turns out that the walls of the offending bedroom just has too much interference. I could have purchased another Google WiFi unit to see if that would help, but I had a bunch of TP-LINKS now sitting around gathering dust. The above configuration did the trick. In addition to providing WiFi to the previous uber-dead zone, I could now control the devices connecting through the remote router with the Google WiFi app on my Android phone.